This post is sponsored by LorAnn Oils, Inc. All opinions are mine alone. Aromatic chocolate hazelnut macarons filled with thick smear of Nutella. Delightful little desserts you can easily whip up in your kitchen. It’s been waaaay too long since I posted a new macaron recipe here. And I know you all love them, just as much as I do. How I know? Well, just take a look at these photos from YOU! Plus, I get a ton of happy comments about your macaron success and questions on troubleshooting. I absolutely love getting your feedbacks. Keep them coming! So yeah, we love our french macarons. 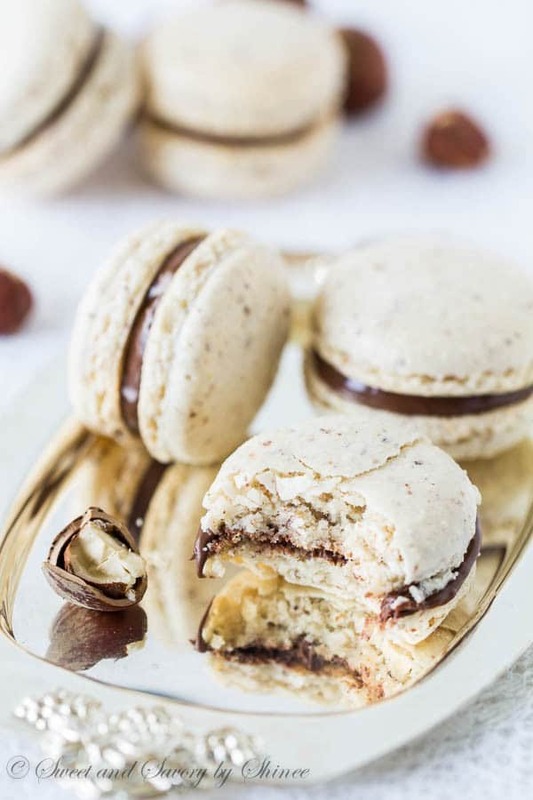 And today I’m sharing with you another fantastic variation: CHOCOLATE HAZELNUT Macarons!! Filled with thick smear of rich and delicious Nutella. 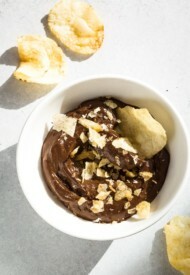 Delicious chocolate hazelnut flavors don’t come just from Nutella. The macaron shells are actually infused with amazing chocolate hazelnut flavor candy oil from LorAnn Oils, Inc. The macarons smell so deliciously aromatic. I’ve been using LorAnn Oils for almost a year now. You might remember I had used their pumpkin spice emulsion for my pumpkin macarons for the first time last year. And I’ve been in love with their products ever since! Ok, now let’s talk a little bit about the recipe and technique. We are using a combination of almond flour and hazelnut flour. I always use ready-to-use almond and hazelnut flour, but if you choose to you can grind your own as well. As far as the technique, we need to follow the same ol’ guidelines. I’ve been giving lots of tips in each of my macaron recipes, and I’m thinking to write a comprehensive French Macaron 101 post to list all the do’s and don’ts of making macarons in one place. What ya think of this idea? Let me know in the comments below, and if you have any specific questions, leave them below as well. Do sift the dry ingredients at least 3 times to get rid of large lumps and big pieces of nut. This is crucial for smooth and beautiful shells. Make sure the mixing bowl and the whisk are absolutely free of grease and oil. And be careful when separating the egg whites from yolks and don’t include a single drop of egg yolk in whites. Any trace of oil and/or yolk will prevent the egg whites to reach hard peaks. Beat the egg whites on slow speed at first and gradually increase the speed as they start foaming. This creates a stable meringue, perfect base for the macaron batter. 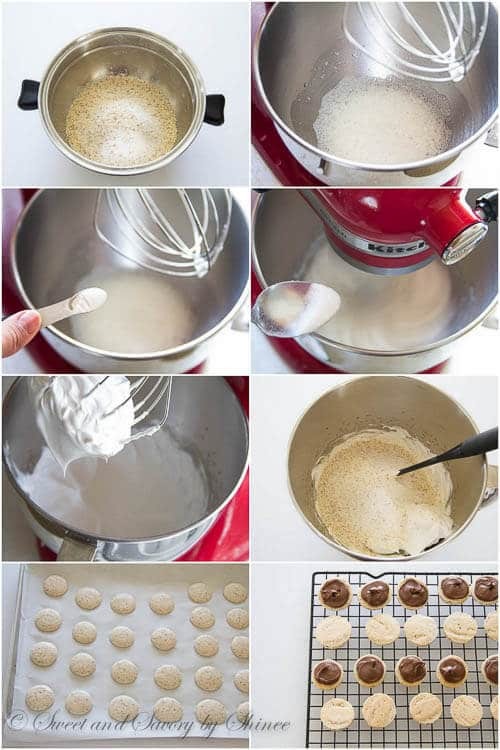 Gently fold the dry ingredients into the meringue until the batter reaches the correct consistency. It should fall into a ribbon and the edges should smooth out within 10 seconds. Once the macarons are piped into rounds, tap the baking sheet on the counter to release any air bubbles and let them rest for half hour or until they form a nice film. This step will prevent any cracks during baking and will create pretty ruffled feet on the bottom. For filling, we’ll use a jar of Nutella. Easy-peasy! Hope you give these lovely little cookies a try. They are absolutely the best thing in the world! In medium bowl, sift together hazelnut flour, almond flour and powdered sugar twice. Set aside. In a large mixing bowl with whisk attachment, beat the egg whites on medium speed until foamy. Add cream of tartar and continue to beat. Slowly add sugar one tablespoon at a time. Increase the speed to medium high and beat until hard peaks form. Add vanilla extract and candy oil. Beat on medium speed for one more minute. Sift the dry ingredients over the whipped egg whites. With a rubber spatula, gently fold the mixture, running the spatula clockwise from the bottom, up around the sides and cut the batter in half. The batter will look very thick at first, but it will get thinner as you fold. Be careful not to over mix it though. Every so often test the batter to see if it reached the right consistency. To test the batter, drop a small amount of batter and count to ten. If the edges of the ribbon are dissolved within ten seconds, then the batter is ready. Do NOT mix again. If you still see edges, fold the batter couple more times and test again. Keep in mind that just couple of folds changes the consistency of the batter tremendously. This step is so crucial, so please make sure to test often to ensure not to over mix the batter. Pipe out 1.5-inch rounds about an inch apart on two baking sheets lined with parchment paper. You should get about 46-50 rounds. Let the macarons rest and dry for 15-30 minutes. On a humid day, it might take an hour or so. To see if it’s ready to be baked, lightly touch it. If the batter doesn’t stick to your finger, then it’s ready. To assemble the macarons, smear a thick layer of Nutella on one side of macaron shell and top with another shell. I made this macaron the other night and it was amazing. Perfect, full shells. And so good. I filled it with Nutela too. Thanks for sharing your recipes. Awesome. So happy to hear you loved the macarons. Thank you for your feedback! I’ve used LorAnn oils before, and find some of them do have a bit of an artificial taste. I read that adding too much liquid, even 1/8 tsp to the macaron shells can be too wet. Do you find the macarons come out well this way, or perhaps add it just to the filling. Have you tried other extracts, other than the pumpkin or chocolate hazelnut? Hi, Ann. You’re totally right on adding too much liquid affect the macaron texture. But with the specified amount in my recipe, it does work out fine. However, I live in relatively drier climate. If you live in humid climate and your macarons come out wrinkled with soft shells, I’d suggest omitting it and just flavor the filling. I’ve used peppermint and vanilla extract extract as well. Hope this helps. Hi and thanks for the great information and recipe. I was wondering if you made your own hazelnut flour from grinding hazelnuts? Hi there! No, I didn’t make my own, I used Bob’s Red Mill Hazelnut flour. I’ve been meaning to try macaroons for a while now. It looks like the time has come. Thanks for the inspiration, Shinee, these look stunning! Thank you, Amaryllis. Hope you enjoy the macarons soon. These are so cute and look so good! Your macarons look gorgeous Shinee! Thanks for sharing this at the Say G’day party! Pinned and look forward to seeing you on Saturday! Shinee, these look amazing… You are one of our favorites this week on the blog and I will be featuring you tomorrow on my Instagram. Thank you so much for linking up to our party! Thank you so much for shout out, Desiree! It was awesome! Your macarons look perfect! I am sure they taste good too! They sure do. Thank you, Angelina! Yes! Yes! Please do a tutorial! I’ve had one brief class, but need all the instruction I can get. I love your recipes, and pin ALL the macaron recipes! Thanks! Oh these look amazing, such a yummy combination. 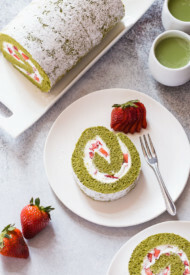 I love making macarons but have never tried anything like this! YUMMY! Decadent and rich , what a great combination! I would love for you to share this at my link party Making Memories Mondays going on now! There’s a great cash giveaway too! Found this on Creative Collection Link Party! Thanks so much for this recipe – love hazelnut! Oooooh, they look DELICIOUS! I like the idea of candy oils, will have to try them out sometime. Candy oils add such a fantastic aroma and flavor, Nicole. Definitely give it a try. Yep, you definitely get an eye for the right consistency with more trials. Thank you, Beeta!